The camera and layers in your panels can be animated. This is helpful to test the potential animation of scene elements. 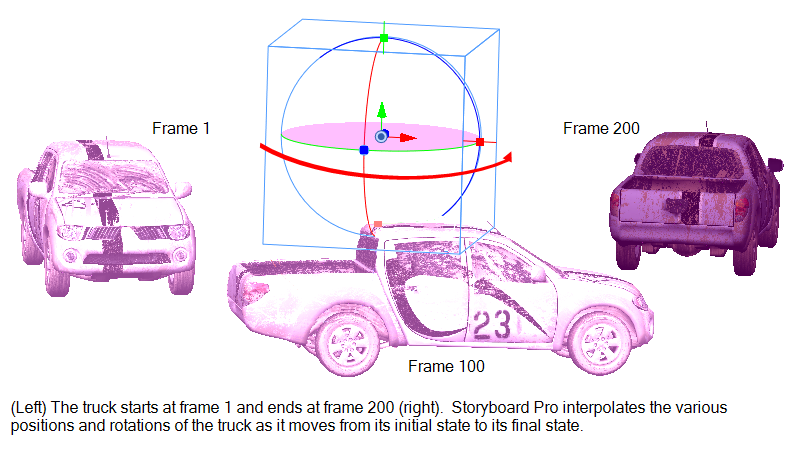 In Storyboard Pro, you can add keyframes to move a camera or layer to a specific position and keep adding keyframes and moving the camera or layer until you are satisfied with the movement. When you play back the panels, the layer moves from one position to the next. By default, layers are not animated. To animate a layer, you will use the Layer Transform tool. Using the Layer Transform tool on a layer that contains no animation will affect the panel's entire duration. NOTE When a layer is selected and the Layer Transform tool is active, the 3D path for the layer is displayed in the Stage, Camera, Top and Side views. As you animate the position of a drawing layer, a motion path is created which are trajectories. Using keyframes, you can then record key positions along the trajectory. You can produce simple and advanced motions and trajectories. Animate mode records the position, rotation, scale, skew, etc. of objects as keyframes in the Timeline view. Turn off the Animate mode to reposition objects for the entire scene. When the Animate mode is disabled, keyframes are not created when an object's parameters change. To animate a layer using multiple keyframes, you must first activate the Animate mode. You can modify the object in the panel and Storyboard Pro will transform the object from one keyframe to the next at a speed defined by the duration of the panel. Deactivating the Animate mode clears all the keyframes and leaves the layer at the position of the current frame.